Giant Room Decorating Kit.Includes: 1 - 15" cutout, 3 - 12" cutouts, 1 - 9" cutout, 6 - 5" cutouts, and 1 - 30' honeycomb black and orange garland. 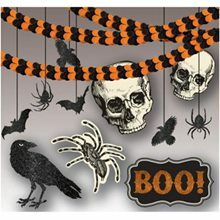 Decorate your spooky haunted house with this awesome collection of spooky decor in this Giant Room Decorating Kit! 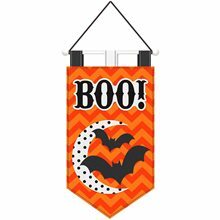 Mostly Ghostly Outdoor Banner.Includes: One White Ghost Outdoor Banner.Dimensions: 15.2m x 45.7cm.Decorate your haunted house with this awesomely spooky Mostly Ghostly Outdoor Banner! 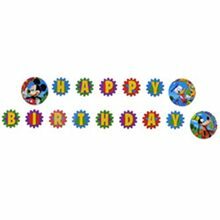 Tinker Bell Plastic Banner: Decorate with this 8ft 5in long Disney's Tinker bell plastic banner. 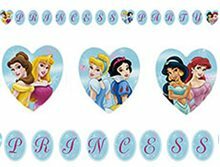 This enchanting wall hanging will add to any tinker bell party. 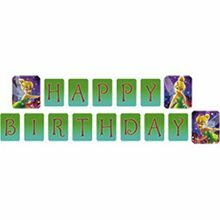 Sticky Tack 4 Scene Setter;Easy to use hang all your decorations safely with Sticky Tack. Our value pack size of Sticky Tack is 5.3 ounces. 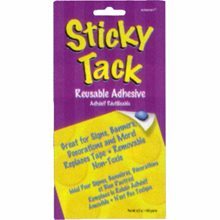 This easy to use adhesive is a GREAT way to hang Signs, Banners, Scene Setters and all your Decorations. Sticky Tack is designed to replace tape and is removable and safe for walls. 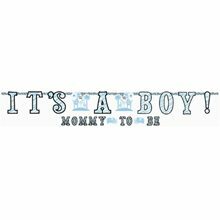 Perfect for many of our banners, posters and wall decorations. Packed in a single retail value package that contains 5.3 ounces of Sticky Tack. Please order in increments of 1 package.